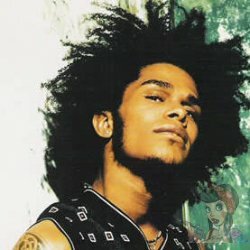 Maxwell Rivera, known as Maxwell is a Grammy award-winning American singer-songwriter, record producer and multi-instrumentalist. His music spans R&B, funk and soul, but he is best known as one of the exemplars of the subgenre neo-soul movement of the latter 1990s. After a successful debut album Maxwell's Urban Hang Suite, he released Embrya, Now and a live album MTV Unplugged. After an eight-year hiatus, he returned with the platinum-selling BLACKsummers'night, the first of a trilogy. He has received 12 Grammy nominations with two wins. Maxwell has one tattoo on his right shoulder of a Celtic design. 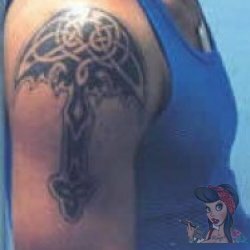 It is unknown what the origin of this tattoo is but it is in the shape of an umbrella so we can only assume it is a symbol that protects him by covering him like an umbrella would.